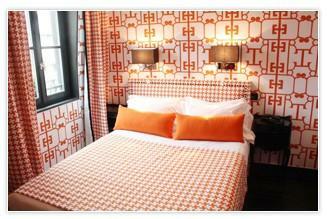 Hotel Monceau-Elysees, Paris. Monceau-Elysees Hotel Paris. Paris is at your fingertips with all the major attractions not far away. This is what Hotel Monceau Elysées has to offer: a cosy, elegant and classy hotel with personality, where the courteous staff is always at your disposal to make your stay unique with advice on monuments to visit and things to see, for your evenings at restaurants or for shows. Personalized and cared-for environments, with elevator, modem for work or surfing the web from your PC, a handy laundry service with your clothes ready in a day. We are located in the heart of the beautiful 17th arrondissement of Paris, a quiet and elegant residential area. A short walk from all the city's charm: Faubourg Saint Honoré for luxury shopping, the Palais des Congrès for your business, Air France’s handy Etoile terminal, all the beauty and life in Paris along the Champs Elysées, ideal for walks and shopping, and Parc Monceau, for a moment of relaxation in greenery and fresh air. The hotel will be closed for renovation from November 30th 2012 to March 31st 2013.